Quinn Boyle is a lobsterman with a shambled boat, a drug problem, and child support he can't pay. Since Quinn lost a man off his boat and served time in prison for cocaine possession, only na ve beginners will work with him. On his final lobster run, Quinn's down to his last options. He hires on an old nemesis, Freddy Santoro, who's facing prison time of his own. Three days later, they're both gone, lost without a trace. Robbie Boyle, a small-time local sportswriter, looked after his younger brother as best he could. Now that Quinn has disappeared, Robbie reaches out to Quinn's estranged daughter, Christine, and assumes the fatherly role his brother never shouldered. A year later, as they admit they might be better off without Quinn's complicated presence in their lives, Robbie gets a strange tip: Santoro is apparently living in the Pacific Northwest. Telling no one and risking everything, Robbie sets out to find Santoro and determine what happened to Quinn. What he discovers will remap the course of their lives. 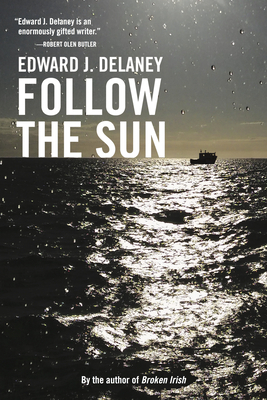 Edward J. Delaney is an award-winning journalist, filmmaker, and author of three previous works of fiction, including his most recent novel, Broken Irish, published by Turtle Point Press. He lives and teaches in Rhode Island. Edward J. Delaney is an award-winning author, journalist, and filmmaker. His books include the novels Follow the Sun, Broken Irish, and Warp & Weft, and the short story collection The Drowning and Other Stories. His short fiction has also been published in the Atlantic and Best American Short Stories, and featured on PRI's Selected Shorts program. Among other honors, he has received the PEN/New England Award, O. Henry Prize, and a National Endowment for the Arts Fellowship. He is also the co-author of Born to Play, by Boston Red Sox second baseman Dustin Pedroia. As a journalist, Delaney has written for publications including the Denver Post and Chicago Tribune, received the National Education Reporting Award, and has served as an editor at the Neiman Journalism Lab at Harvard University. As a filmmaker, he has directed and produced documentary films including The Times Were Never So Bad: The Life of Andre Dubus and Library of the Early Mind.Born and raised in Massachusetts, Delaney has also spent time in Georgia, Florida, and Colorado, and now lives in Rhode Island, where he teaches at Roger Williams University and edits the literary journal Mount Hope.